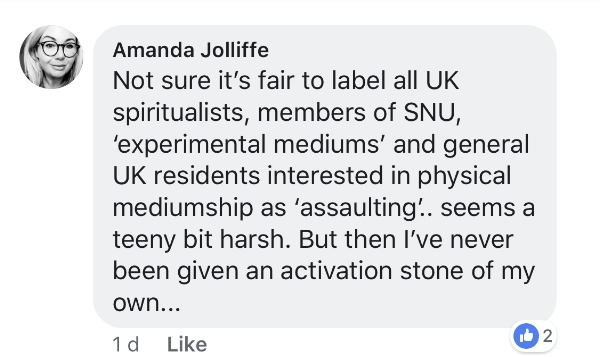 Ok so the UK responded to my article Assault on Physical Mediumship as expected. My blog clearly states my articles are just my opinion and certainly do not claim any authority as suggested by the regular cyber bullies (yes you Neil Powell and Karl Jackson Barnes). This is a classic example of misinformed assumption. 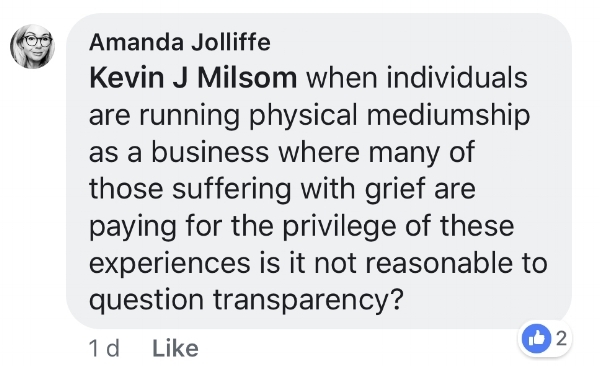 The centres I have been involved with concerning physical mediumship did not run the events as a business and certainly do not profit from the work. Quite the opposite and these gatherings certainly have nothing to do with those in grief or suffering! Survivalism eat your heart out! Amanda’s interpretation is interesting and I even state in my article it was a very generalised statement as my personal system for classifying different mediums. Then her good friends Neil and Karl critised me for having my own opinion that differs from theirs. The rest is too childish to comment or post! Constructive criticism I can work with. Thanks Chris I have updated accordingly. How I classify is a personal method that I certainly do not claim must be adopted by anyone - these are my classifications I work with for my own research. For clarification purposes, it is not types of mediumship but how I classify different mediums. Thanks for reinforcing my point Kevin. If you are not willing to think outside the box then you will never grow outside the box. These mediums have many times provided specific validated information concerning loved ones, names and apported personal items connected to those who have crossed over and hand written letters. But your harsh criticism of their practices outside your survivalist world view is what prevents you learning and experiencing other forms of spirit interactions. What monetary gain once again? Many of the events are charity events and certainly not profitable. Furthermore most of the physical mediumship demonstrations have been in light for quite some time. Development in light however is a much more complex process that takes greater time to achieve but it is certainly already being achieved to this very day! We have all seen the video and frankly it has no similarity to any Gary Mannion seance I have attended. I personally believe it was a constructed campaign in an attempt to reclaim public interest in Banyans own physical medium- who refused filming protocols at AFC stating “not all phenomena is captured by cameras”. Furthermore platform mediums do have bad days where their readings are sometimes just way off. Yet they are excused and pardoned, but a physical medium is crucified unfairly and ‘his life work attacked over one sitting’. Just step back and analyse that for a moment and if you genuinely feel that is fair and just, then I frankly do not understand you as a human, littlelone a spiritual person. 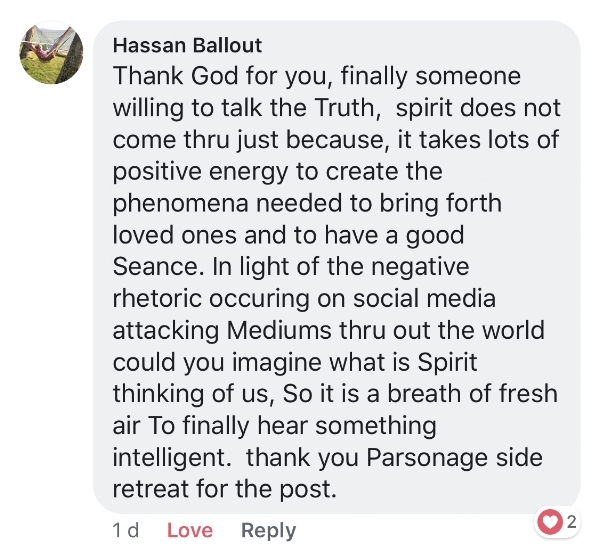 To answer your question, the spirit teams and mediums are working with scientists who are studying the phenomena and validating the spirit paradigm. Neil made a claim about low level frequencies which just isn’t worth discussing. The tone of the comments coming from the UK reinforce the point I made in my article, which again is an opinion expressed on a personal blog. If you don’t like it, don’t read it and do something positive to make the world a better place.! 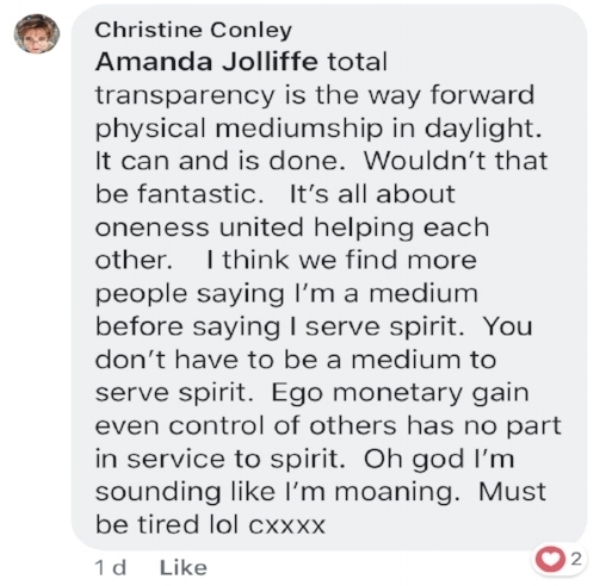 Despite the same cyber bullies attacking this mediums opinion and system of categorising, there has also been heaps of really positive feedback and the article viewed and shared by thousands of spiritualists from around the world in a matter of days. My opinion is only just that and your free to think and believe anything you like. Don’t waste energy arguing and just write something brilliant that inspires others to consider your world view. Afterall I’m just an average Aussie bloke sharing my thoughts on a personal blog - dont loose sleep over it mate!